Cheder Chabad of Monsey have been working diligently and giving beyond expectations to educate our children and inculcate them with chassidishkeit and middos tovos. Our community's Mechanchim more than deserve to have the peace of mind of being able to provide for their families and we all have an obligation to do everything we can to make sure that they are paid in a timely fashion. 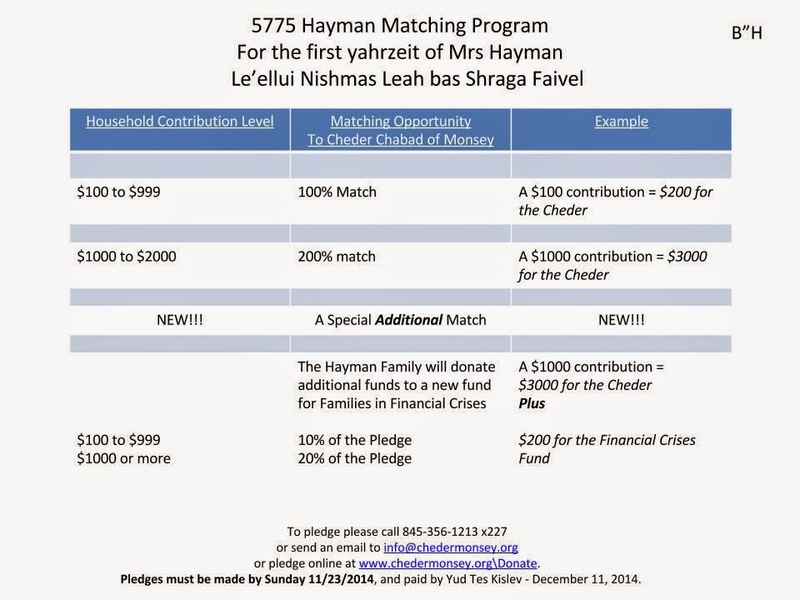 To that end, Avraham and Devorah Hayman have announced a surprise matching opportunity, in honor of Avraham's mother’s first Yahrzeit, Leah bas Shraga Feivel, z"l. The Hayman's will double match any donation of $100 to $999 and triple match donations of $1,000 to $2,000 that are pledged this week through next Sunday evening, 11/23. In addition the Hayman’s will contribute and additional 20% of all donations of $1,000 or more and 10% of donations less than $1000 to a special fund designed to help Families in Financial Crises. All pledges must be paid by Yud Tes Kislev, 12/11. All contributions will go to support the Cheder’s daily operations insuring that our mechanchim will be paid on a timely basis.